Fire is a masculine element, hot and dry, it's colour is red, and it's direction is North (in the southern hemisphere, south in the northern hemisphere). Fire represents the passion and desire burning inside all of us. As sexuality, fire is the most physical and the most spiritual of elements. Fire is also linked to courage and transformation. It is the element of change, and the spark of spirit within all of us. It is probably one of the most loved, and yet most difficult element to work with - it is swift and unpredictable, yet it captivates us with a deep primal fascination. you can feel it's warmth, and see it's flames. you can feel it's power, yet cannot hold or touch it. It can burn furiously, or lie and smoulder until the right time. 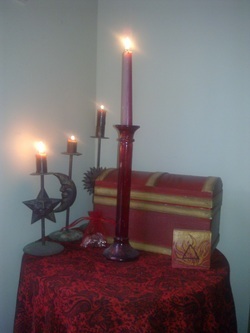 Altar tools - Athame, wand, rod & Candle, Dagger, sword, censer, lamp, incense, herb burning, paper requests, knife. chakra - solar plexus. Elemental - Salamander. Animal, (Lakota) - Lion, mouse. . Sabbat - Litha. Solar midpoint - Summer Solstice. Time of day -noon. Weather -hot .Zodiac: Aries, Leo, Saggitarius. Function - feeling. Sense - sight. Tarot - Swords. Attribute - spiritual, potent.